We use 100% acrylic/polyester canvas (Sunbella and Top Notch), these offers a five year warranty with your choice of 64 colors. 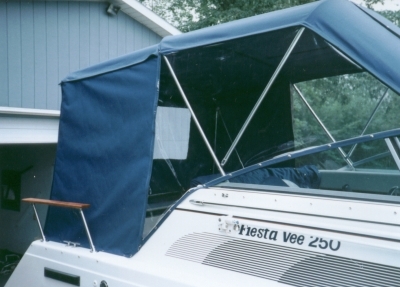 It is reinforced with heavy coated vinyl on wear areas with your choice of adjustable mooring pole or fiberglass slats to channel rain off your cover. Need help choosing a cover? As you can imagine, the variations of different kinds of tops and covers for your particular boat can be numerous. But, of course, that is where we come in to customize canvas for your specific needs. 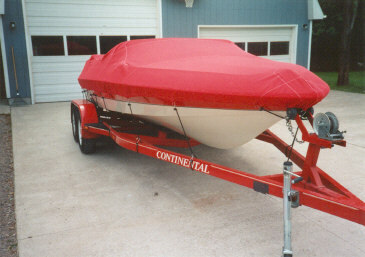 This cover is custom-made to each boat from sizes 12-30 ft. This cover is trailerable if reinforced and custom fit properly. 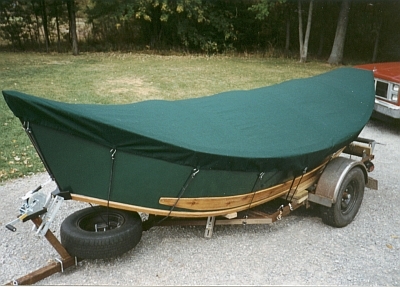 We finish this cover with a bottom-edge drawstring and vinyl reinforcement on the wear-areas plus rubber rope tie-downs to tension the cover to the trailer. 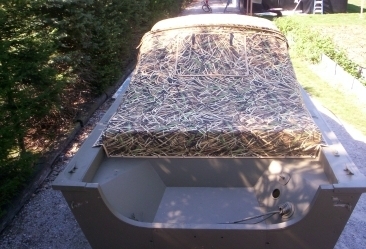 This cover can be used in the water, traveling down the highway, or in dry storage. This is a convertible top, on an aluminum frame, which folds down for storage. We can add a zippered flap to accommodate split windshields. The rear of the sports top has 1-inch adjustments straps for future adjustments. The leading edge of the sport top is snapped to the top of the windshield. 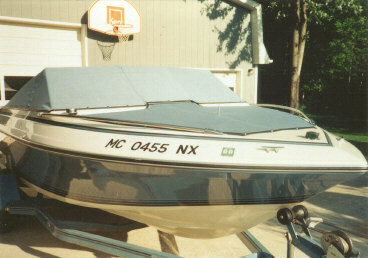 The same as a sport top, but the rear corners have diagonal pieces of fabric to snap onto the beam of the boat instead of the 1-inch adjustment straps. 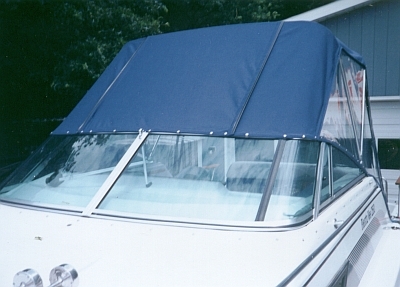 This pair of vertical clear plastic curtains allows users to zip them to the sport/convertible top and snapped to the board to enclose the front seats of the boat. 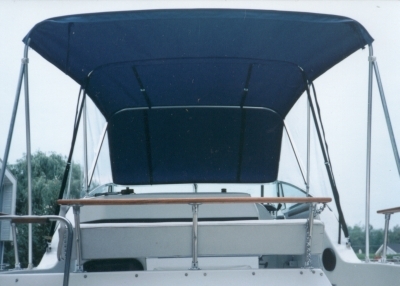 This cover snaps to the open bow of the boat, which encloses the seating and storage areas ahead of the walk through windshield. A vertical mooring pole holds up the center of the cover, which allows water and rain to run off. This cover zips on to the top rear of the sport/convertible top and the rear of the side curtain. The aft curtain snaps to the side beams of the boat, follows that back to the rear then across the stern. 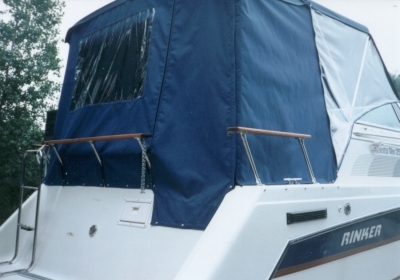 This diagonal aft curtain covers the rear interior of the boat. 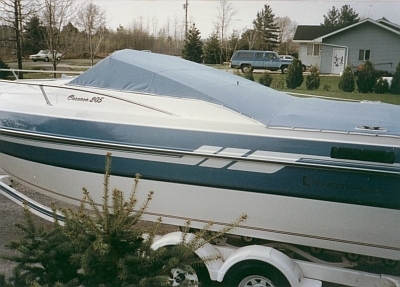 Boaters who leave their boats in the water and need a convenient way to cover the interior without taking down the sport/convertible top usually zip on the aft curtain. 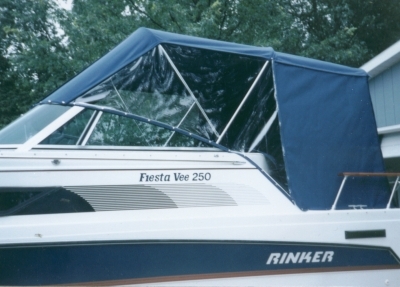 This top is generally used on larger boats (25ft +) or with a fly bridge. 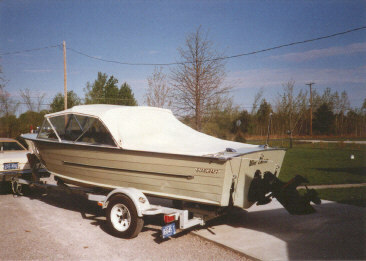 Many people confuse this bimini top with a sport top or convertible top. A bimini top is designed on a 3 or 4 ribbed frame with adjustable tie-down straps—both forward and aft. It is not attached to the windshield and is normally larger than both other tops. 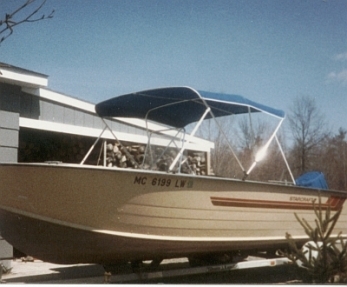 In addition to the straps, it may also have stanchions (diagonal frame tubing) attached to the bimini top frame then diagonally to the boat beam to stiffly secure it to the boat. This top is zipped on to the rear edge of a sport/convertible top. The camperback top is on a separate frame. It covers the rear of the boat all the way back to the stern-overhead. 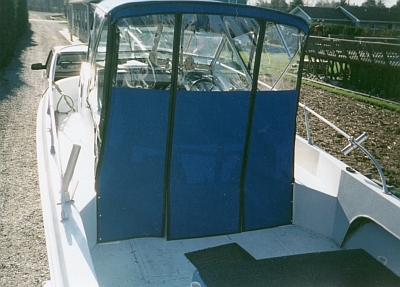 On some original equipment setups, the rear side curtains (behind the vertical clear plastic side windows) and rear vertical stern rear curtain are incorporated as one single unit. But custom shops generally make the camperback, vertical rear side curtains, and rear vertical stern curtain separate with zippers or snaps. This pair of curtains attaches (zips on) to the rear of the vertical clear side curtains and zips onto the top edge of the camperback. These curtains can incorporate clear window plastic or screens with clear plastic windows, or even solid fabric, depending on the ventilation or privacy needs. This rear stern curtain also has many variations. This curtain can incorporate a clear plastic window and/or screen with a clear plastic window, and/or solid fabric which allows for privacy or ventilation needs. An entry zipper may be needed as an added feature. This curtain, by zipping it to the back of a convertible top and side curtains, is a favorite of the foul-weather sportsmen, allowing the comfort of a semi-enclosure (mini-camperback). Give us a call to answer all your questions or to make an appointment. Call (989) 642-2255 or email us today!